I haven't found as many books as I usually do throughout the week, but I do think that is a good thing for both my bank balance and my TBR list. Eva over at A Striped Armchair is definitely having a bad effect on my TBR list this week, as she features twice. Eva is the type of person I would call a voracious reader, as she devours so many books in a week. I am completely jealous about her reading ability. This book is the first of a new mystery series set in Africa. What attracted me to this story was the main character Inspector Dawson, who has anger management issues. In a shady grove outside the small town of Ketanu, a young woman—a promising med student—has been found dead under suspicious circumstances. Eager to close the case, the local police have arrested a poor, enamored teenage boy and charged him with murder. Needless to say, they are less than thrilled when an outside force arrives from the big city to lead an inquiry into the baffling case. Detective Inspector Darko Dawson, fluent in Ketanu’s indigenous language, is the right man for the job, but he hates the idea of leaving his loving wife and young son, a plucky kid with a defective heart. Pressured by his cantankerous boss, Dawson agrees to travel to Ketanu, sort through the evidence, and tie up the loose ends as quickly and as efficiently as possible. But for Dawson, this sleepy corner of Ghana is rife with emotional land mines: an estranged relationship with the family he left behind twenty-five years earlier and the painful memory of his own mother’s sudden, inexplicable disappearance. Dawson is armed with remarkable insight and a healthy dose of skepticism, but these gifts, sometimes overshadowed by his mercurial temper, may not be enough to solve this haunting mystery. In Ketanu, he finds that his cosmopolitan sensibilities clash with age-old customs, including a disturbing practice in which teenage girls are offered by their families to fetish priests as trokosi, or Wives of the Gods. 2) Hardboiled and Hard Luck by Banana Yoshimoto. This is another one that I found over at Eva's blog. Eva has been participating in the Novella Challenge and this she read this book as one of her choices. It contains two novellas which have a ghostly feel to them. Here is the blurb from Book List. In her seventh book of spare, piercing fiction, Japanese writer Yoshimoto once again portrays strong-minded young women coping with heartbreak, traumatic family fissures, drastic illness, and fatalities. This sounds grim, but Yoshimoto is tenderly ironic and keenly attuned to nature's beauty and the mystic dimension of life, and her characters' ability to tough their way through painful predicaments infuses her elegantly insightful stories with hope. Here two novellas portray two self-possessed yet besieged young women. In "Hardboiled," the narrator is on a solo journey that begins as a simple mountain trek and turns into an intense confrontation with otherworldly forces, including a ghost in a hotel and overwhelming memories of a lost lover and her terrible demise. In "Hard Luck," a tale all the more poignant in the wake of Terry Shiavo, the narrator's sister lies in a coma as her family struggles to find a way to say good-bye. I found this one over at Alyce's blog At Home With Books. This comes across as a harrowing look at unwanted teenage pregnancy and is written in the present tense, so you get a sense of immediacy. An infant left in the trash to die. A teenage mother who never knew she was pregnant . . .Before That Morning, these were the words most often used to describe straight-A student and star soccer player Devon Davenport: responsible, hardworking, mature. But all that changes when the police find Devon home sick from school as they investigate the case of an abandoned baby. Soon the connection is made - Devon has just given birth; the baby in the trash is hers. After That Morning, there's only one way to define Devon: attempted murderer.And yet gifted author Amy Efaw does the impossible - she turns Devon into an empathetic character, a girl who was in such deep denial that she refused to believe she was pregnant. Through airtight writing and fast-paced, gripping storytelling, Ms. Efaw takes the reader on Devon's unforgettable journey toward clarity, acceptance, and redemption. I found this one yesterday over at Nicole's blog 'Linus's Blanket'. The reason I was attracted to this book is that it deals with the events surrounding a hurricane in 1954 and it looks at the consequences of the main characters actions for himself and the people surrounding him. When Hurricane Hazel tore through Toronto on October 15, 1954, it left its mark on both the city and its inhabitants. In the aftermath, a young cop named Ray Townes emerges as a hero—numerous accounts detail the way he battled the raging Humber River to save those trapped in their homes—and his story is featured prominently in the newspapers, thrusting him into the spotlight as a local celebrity. Meanwhile, his wife Mary is wrestling with doubts about her husband’s heroism. While performing her own miracles the night of the storm as a nurse at a mud-filled, overcrowded emergency room, Mary met a woman—disoriented and near death—with a disturbingly peculiar recollection of events. While Mary tries to shake her suspicions about Ray as they rebuild their life in the shell-shocked city, she can't help but wonder about her husband and that fateful night. When a reporter comes knocking 50 years later to revisit that horrendous night, the truth begins to surface and threatens to destroy them. Hi Viv, I love all the book covers here and the stories are interesting too. I especially like the sound of Hardboiled And Hard Luck - an usual title for a book, don't you think? I read Wife of the Gods over the summer and really enjoyed it. I want to check out After. The last books I read with hardboiled in the title was Hardboiled Wonderland and The End of the World by Haruki Murakami. It went straight over my head. Alice - thanks. Now if only I could buy them all. Sigh! Petty Witter - it is an unusual title. I am desperate to read it. I doubt our library system will have it in though. Nicole - Wife of the Gods is just so appealing. Hardboiled is definitely a word I wouldn't imagine finding in a book title. I really want to read something by Banana Yoshimoto just so I can see her name! Great finds. I read After by Amy Efaw back in September (I think) and it is brilliant. One of my favorite reads this year. I hope you like it. Oh, these sound good! I've been hearing about the book "After," and now it has to go on my list! 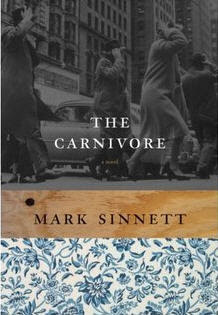 I just added The Carnivore to my list - it looks fabulous! I hope that you get a chance to read After, it really was a powerful read. Yay-both the books you found at my blog are awesome! :D I'm not the biggest YA person, but I love the cover of After. I didn't know Toronto could get hurricanes-I've always thought of them as being closer to the equator! Fantastic finds! I'd love to read any of these. Nice list. Love the cover of Hardboiled & Hard Luck. It sounds more serious than the cover would lead me to believe! You always have some great finds! 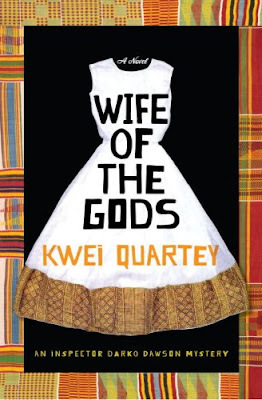 Oooh, I actually have Wife of the Gods in my tbr pile! Must move it up. These look so great! After is one I have read a bout and it sounds good! I just finished a book by Banana Yoshimoto recently and am working on the review. Hardboiled and Hard Luck sounds .. interesting. I will have to look for this-I am Canadian living in the US have lived in TO and never heard of a hurricane ripping through TO. thanks-I found you from Amy's blog.